If you're looking to spice up your fitness routine, then consider setting up a yoga swing in your own home. With the right yoga swing, you'll be able to try all kinds of upright, horizontal, and even fully inverted exercises, all the while maintaining proper body alignment. Keep on reading to learn more about the endless possibilities you can explore with a yoga swing! A yoga swing or yoga trapeze, as it is sometimes called, is a purpose-built swing that is primarily used for aerial yoga. Aerial yoga has its roots in traditional yoga. It shares the same fundamental objectives, and is thus grounded in its focus on the synergistic relationship between body and mind. In both activities, special attention is paid to body awareness, breathing patterns, and postural stability. While aerial yoga does take some inspiration from traditional yoga, it also borrows movement patterns from acrobatic gymnastics. The main difference between aerial and traditional yoga lies in its execution. Unlike traditional yoga, the postures in aerial yoga are meant to be performed in midair, against gravity. 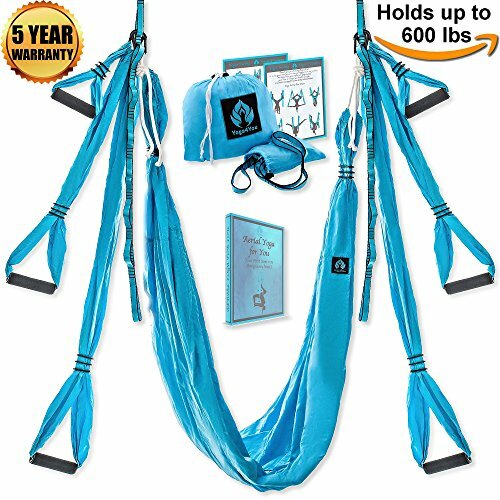 The yoga trapeze itself uses a suspension system that involves carabineers and support straps. 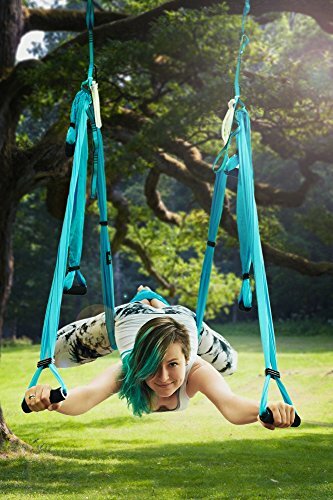 The suspension system is designed to hold up the hammock, so that your body remains suspended for the duration of your exercise session. The hammock is made of soft fabric materials, while the support straps are made of either rope or webbing. When you're ready to setup your yoga swing, always follow the instructions provided by the manufacturer. It's not worth the risk of injury, simply because you neglected to install the swing properly. 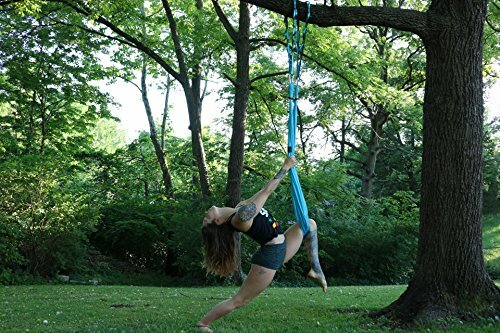 That being said, most yoga swings are designed to be suspended by just about anything that can support the combined weight of the suspension system and of course, the user. If you travel often, the portability of your yoga swing will likely be important to you. You'll be happy to know that it's even possible to hang your trapeze off a tree branch. Say hello to outdoor yoga! Otherwise, there are many places to set up your yoga swing inside the home. Depending on the swing you've purchased, it may come with ceiling hooks and/or suspension straps. The general rule of thumb suggests that straps are preferred to hooks, as long the crossbeam or railing you've chosen is securely mounted. Also, remember to lay out a yoga mat underneath your swing, so that you have something to stand on. Whichever installation method you choose, be sure to double check with a professional contractor if you are at all unsure. With such a versatile piece of fitness equipment, the benefits of the yoga swing are countless. For starters, it can be used to elevate your standard yoga routine - literally! Some people swear by aerial yoga exclusively, only after giving it their first go. But you don't have to give up traditional yoga to try aerial. In fact, the best time to try aerial yoga is when you find yourself in a fitness lull. The ability to move around freely while you're suspended in the air gives you a whole host of options for new stretches and postures. Just the fact that you're able to exercise in midair should rekindle your enthusiasm for fitness. If you're familiar with the TRX System, then you'll know that it's just another form of suspension training. Well, your brand new yoga trapeze can also be used like a TRX System. You can create blended workout routines, where you take inspiration from yoga and TRX suspension training to reach your fitness goals faster. Suspension training takes advantage of gravity, so that all of the exercises are performed using one's own body weight as resistance. This means that you can get more out of your workouts in a shorter time frame. It's also easy to adjust the swing for any user and each specific exercise, since there's no need to jump from machine to machine - the trapeze is an all-in-one machine. To cap off a workout well done, you can relieve any back pain or muscle tension with an at-home inversion therapy session. It's no longer necessary to book yourself in at the clinic for an appointment with the chiropractor when you have your very own yoga swing. The theory behind inversion therapy is simple. We spend so much of our time upright that our spine and surrounding back muscles suffer from undue stress. By hanging completely upside down, we give our body a break from that pressure much like using an inversion table. 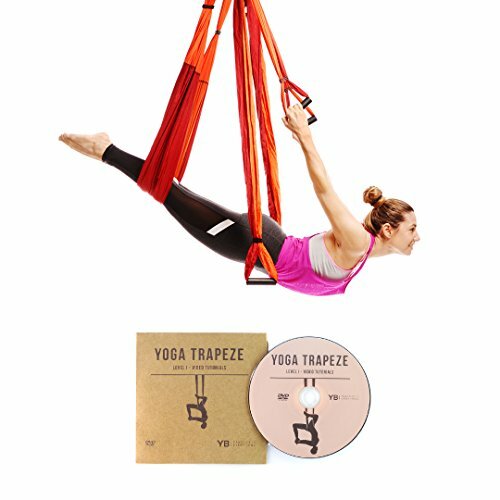 The Yoga Trapeze by YOGABODY Naturals is best-selling for good reason. Thanks to the free online setup guide and video tutorials, this trapeze is super easy to mount and install without professional assistance. It should be noted that this trapeze only comes with suspension ropes for hanging from a crossbeam or a tree branch. If you're hoping to hang it from the ceiling, the door frame, or a stand, you'll need to purchase the necessary accessories separately. 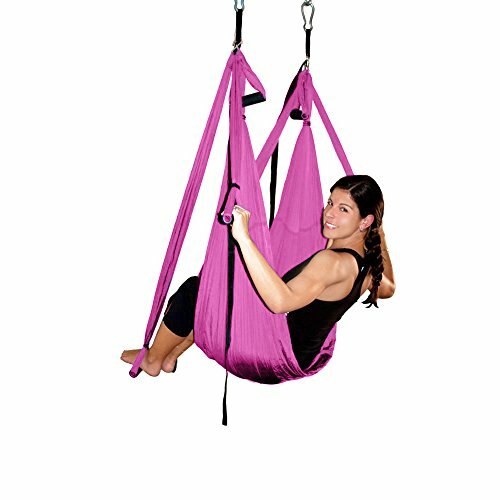 This is a studio-grade yoga swing at an affordable price. The swing has dimensions 12 x 6 x 8 inches and weighs about 4 pounds. 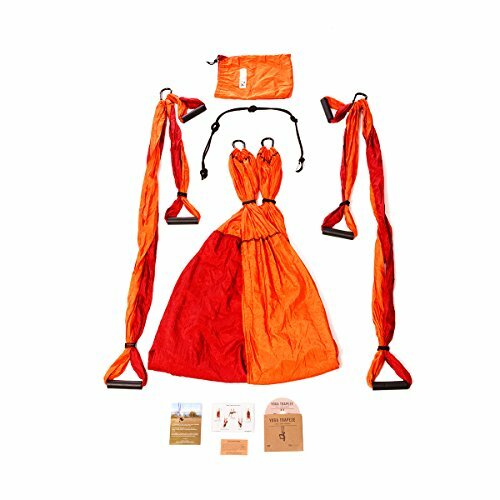 The package comes with the main sling, made out of a fabric material similar to what parachutes are made of, two sets of rubber grip handles, four carabineers, two knotted ropes, and everything comes in a drawstring carrying bag. This parachute fabric has been stress-tested to accommodate up to 600 pounds. The company also offers a 10-year full warranty for any mechanical defects. The UpCircleSeven aims to brighten up your home gym with their yoga swing, which is available in six vibrant colours. You'll also have peace of mind, if you decide to try out this swing. 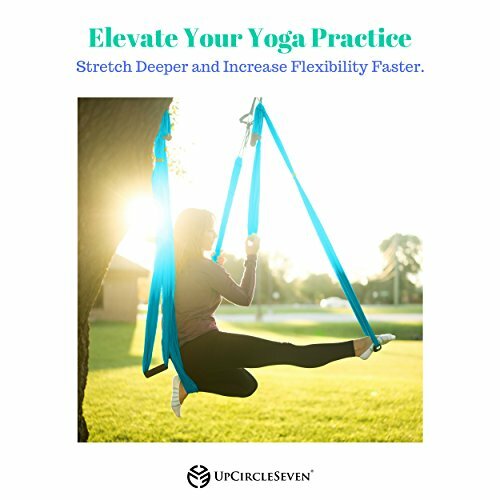 UpCircleSeven stands by their product so much so that they offer a 30-Day Challenge within which any buyer can decide if the swing is right for them. If you are unsatisfied at the end of the thirty days, you'll receive a full refund, hassle-free. This yoga swing is favoured for its larger than average seat width. At 250 x 150 centimetres, this swing offers a much more comfortable experience than a smaller hammock would, especially for bigger and/or taller users. The handles on this swing are also generously padded, to provide adequate cushioning for extended use. 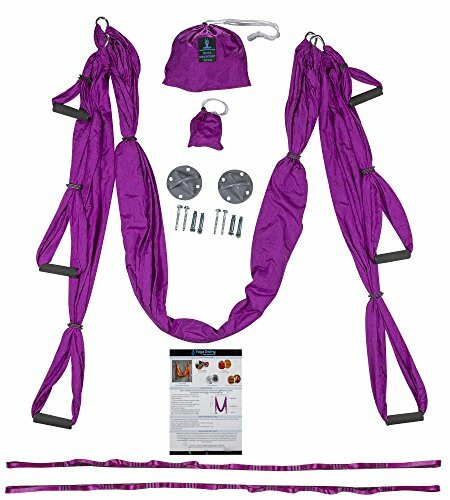 Setup is simple enough with this trapeze, however, mounting accessories are not included and must be purchased separately. 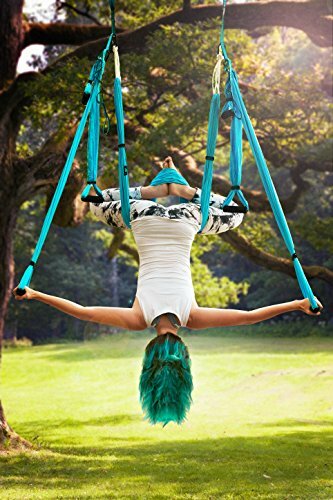 This swing comes with the hammock, two sets of well-padded handles, two height-adjustable daisy chains, four carabineers, a travel bag, and a PDF e-book guide for beginners. The yoga swing by AGPTEK is one of the most affordable and lightweight options on the market right now. Weighing in at just over 2.5 pounds, this is the swing to bring with you if you're a lover of outdoor yoga sessions. It's also a good bet for anyone on a budget. Instead of parachute material, like the two swings above, this trapeze uses a polyester taffeta fabric attempting to replicate the soft touch of silk, but at a lower price point. This difference in material doesn't affect the weight capacity of the hammock, however. It can accommodate users of over 600 pounds. The handles are also made of foam, rather than rubber. The Yoga4You trapeze combines build quality with a reasonable price tag. The hammock on this yoga swing is made of nylon, which feels almost as soft as silk. However, the handles are made of plastic and are covered with foam grips. It also doesn't come with mounting accessories, except for two suspension ropes. For this reason, this swing is best suited to an environment with an existing crossbeam, like an indoor pull up bar. 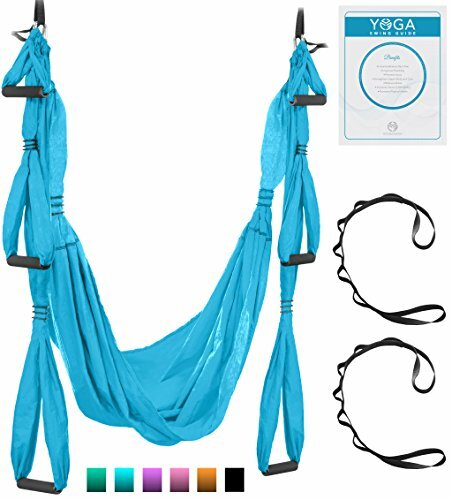 The manufacturer ships the yoga swing with a digital PDF guide for beginners, including how to setup, adjust, and use the swing. The seat width on this is plentiful at 250 by 150 centimetres, and it is strong enough to bear weight up to 600 pounds. The swing also comes up two long hanging straps, each measuring 50 inches, so it can accommodate taller users. Blue Crescent Yoga wants you to start off strong, and includes all of the mounting accessories (i.e., ceiling hooks) upon shipment. This hammock is known for being super soft, while also being super durable. It can support weights up to 550 pounds. The two sets of handles are included, and are padded with foam. Thanks to the ceiling hooks, the swing is easy to setup and takedown, in case you want to switch between your living room and the park for your yoga sessions. The travel bag helps with easy transport, as well. And there you have it, five of the best yoga swings on the market right now. We hope this in-depth look at yoga swings has helped you pick the one that best suits your needs!